In 1988 Mr. Labriola developed a training session for the development of basic hand drumming technique. Hand Drumming refers to a system of rhythmic techniques applied to various cultural/ traditional Percussion instruments. Each instrument has a specific country, region, or culture of origin, and sometimes the instrument can encompass several regions simultaneously. Along with the instrument’s place of origin, there exists a specific set of variables of approach and maneuverability i.e. a technique very specific to each instrument. In addition to the musicality of the instrument, one must also consider cultural sensibilities. Ethnic customs, demeanor, attitude and cultural context are vital in understanding an art form derived from a specific culture of peoples. Rhythm Roots Workshop combines traditional drumming techniques with a sense of cultural awareness and appreciation. To elaborate more fully, this means to learn intellectual variables (technique) by means of honoring and respecting the founders of this knowledge. 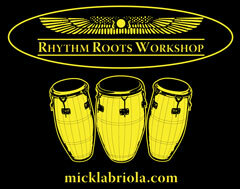 Rhythm Roots Workshop has a variety of teaching formats according to duration. The Workshop(s) can vary from a one hour session to a full length Residency Week (4 to 6 classes per day) culminating into a final day Residency Performance by the students. Residencies generally consist of two categories; with an option of creating a custom Residency at the Schools request. Developmental or Core Group Residency-Working with a class in multiple sessions. General Overview Residency/Workshop-Working with a class in only one session. Congas-3 sizes Tumba-Conga-Quinto Cuban Style. Gon Bop, Valje & LP. Claves, Cowbells, Tambourines, Maracas, Cabasa, Guiro, Sherkere etc.